The worlds of academia and UK research councils are increasingly interested in interdisciplinary research due to its ability to generate new insights and perspectives on often complex and intricate topics and issues (Phillipson and Lowe, 2006). There is also a body of research to suggest that interdisciplinary research teams that include early career researchers have mutual benefits for the both the ECR and research organisation; the ECRs develop their research and interpersonal skills and the organisation can retain and development new talent (Sobey et al., 2013). 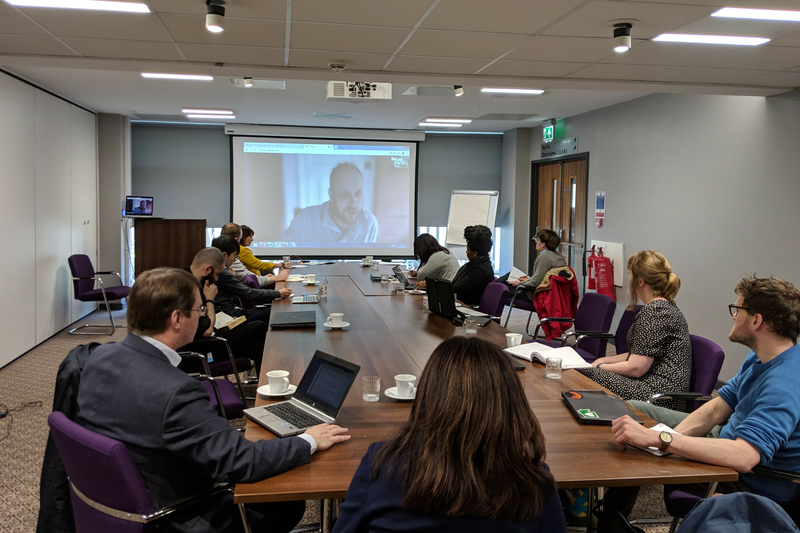 In March 2019 PIN was delighted to welcome back early career researchers (ECRs) old and new to our second ECR workshop in Sheffield. PIN, with the full support of the ESRC and under the leadership of Professor Leaza McSorley, is committed to developing ECRs interested in cross-cutting themes that affect productivity. Building on the success of our first ECR sandpit in November 2018, we hosted our second two day ECR event to incorporate the expertise shared at the PIN conference and mentoring from a range of experts in the field. 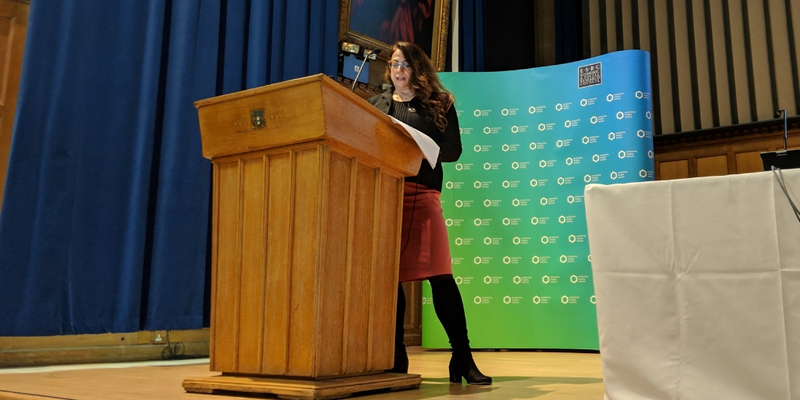 On the first day of the ECR event participants joined the PIN conference and heard fascinating insights on a range of productivity issues from our keynote speakers Professor Sir Paul Collier, Professor Jennifer Rubin, and Murray Sherwin. Lively debate and discussion ensued as our esteemed panel experts shared views on productivity in places, practice and prospects. For an overview of the conference, see our Advancing the Debate blog. On the second day we heard from Lukas Nüse and Armando García Schmidt from the Inclusive Productivity project at Bertelsmann-stiftung, an organisation whose programmes deal with the challenges that result from globalization, demographic change and the growing diversity of Germany’s population. 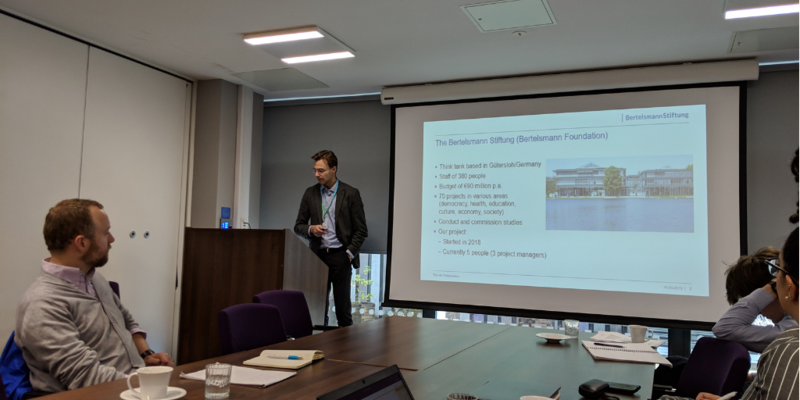 Lukas shared their approach to inclusive productivity and the Q & A that followed raised what for some was a surprising insight into Germany’s productivity divide between the North and the South, not dissimilar to the issues facing the UK. This was followed by a bid writing development workshop from Professor Tim Vorley. Tim provided an overview of the PIN open call along with sharing advice and valuable insights on bid preparation. Having heard from the German and UK productivity research landscape in the morning it was the New Zealand perspective that followed after lunch. Murray Sherwin built on his key note speech delivered at the conference to answer questions and share his views on the pressing issues that merit further research. Full of questions, our ECRs were then mentored by PIN members including Professors Leaza McSorley, Philip McCann and Dr Rob Wapshott, who advised them on the questions that they had about their own research. We look forward to continuing our support for the network of talented and engaged ECRs that we are seeing emerge with the encouragement of PIN. There will be further opportunities for the ECRs to become part of the PIN network and updates on this will be shared via the mailing list and Twitter. Phillipson, J. and Lowe, P. (2006) ‘Special Issue Guest Editorial: The Scoping of an Interdisciplinary Research Agenda’, Journal of Agricultural Economics. doi: 10.1111/j.1477-9552.2006.00044.x. Sobey, A. J. et al. (2013) ‘Incorporation of Early Career Researchers within multidisciplinary research at academic institutions’, Research Evaluation. doi: 10.1093/reseval/rvt004. 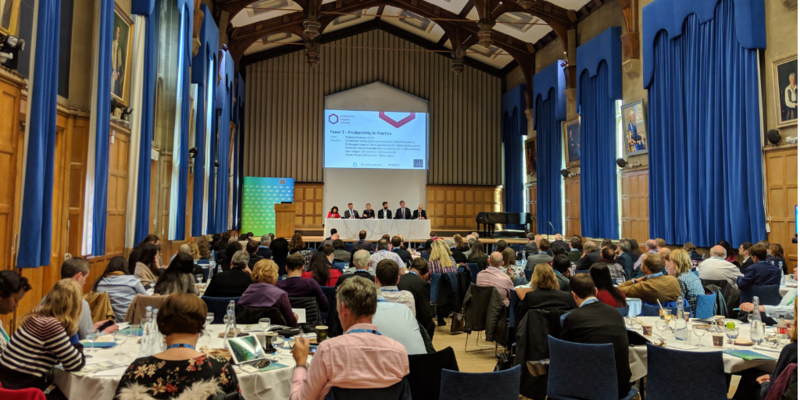 In March, we were delighted to bring together a diverse audience of policymakers, businesses, academics and many others who have a desire to address the UK’s productivity puzzle. 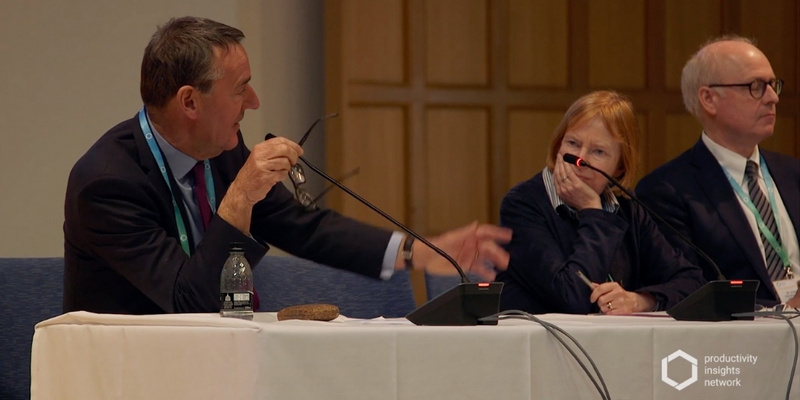 We are very grateful to our host Lord Jim O’Neill and keynote speakers; Professor Sir Paul Collier, Murray Sherwin and Professor Jennifer Rubin, for leading an action packed day of discussions around all of aspects of UK productivity now and into the future. In this short overview blog, you can access some of the talks from the conference as well as hearing about next steps. You can also check out the full conference brochure by clicking on the photo below and get a sense of live commentary on the conference Twitter wall. In a return to his native Sheffield, Professor Sir Paul Collier kicked off the conference with a bang with a rousing keynote speech entitled “Restoring Convergence: Productivity and Prosperity in Britain’s Regions”. You can watch Sir Paul’s talk in its entirety below. Keynote speaker: Sir Paul Collier, Professor of Economics and Public Policy at the Blavatnik School of Government, University of Oxford. Sir Paul’s research covers fragile states; restoring growth in African economies, the implications of group psychology for development; migration and refugees, which are the subject of his two most recent books; urbanization in poor countries, a program which has just won challenge funding from the Foreign Office; and the crisis in modern capitalism, which is the subject of his most recent book, The Future of Capitalism, published in October. Sir Paul received a knighthood in 2014 for services to promoting research and policy change in Africa and has been listed as one of the hundred most influential public thinkers in five of the past ten years. • The opportunities to work in partnership through local industrial strategies to create more prosperous and productive communities. • How the UK’s Shared Prosperity Fund will tackle inequality by raising productivity. • The focus on place based growth can address regional imbalance between London (and its hinterland) and elsewhere. • Alternative perspectives on the regional productivity agenda and the wellbeing of places and their populations. • Lessons and best practice from places that have successfully addressed the challenges of regional inequality and low productivity. Following a lively panel Q & A with the audience, a short break allowed attendees to digest and further discuss some of themes covered so far. Indeed, one of the primary aims of the PIN conference was to create these sorts of discussions and connections in the room. Professor Tim Vorley, Co-director of PIN, picked up on the theme of creating connections and multi-disciplinary working to break down silos, by announcing the second round of the #pieceofthepuzzle campaign. Have you got an innovative idea related to UK productivity? We’d like to hear from you. Tim also provided an update on the regional events that PIN is running in order to test and refine our insights. 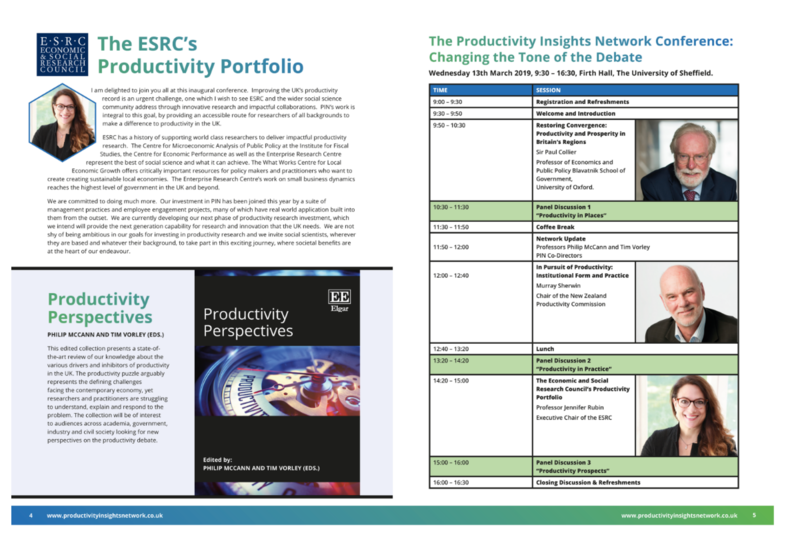 All of our evidence reviews to date can be found in the upcoming “Productivity Perspectives”; a book written by our team of thematic experts which will be published by Edward Elgar in Summer 2019. You can watch Tim Vorley’s 15 minute update below. We were delighted to have a number of international guests at #PIN2019, sharing learning from their own national contexts as well as global research. None travelled further than our second keynote speaker, Chair of the New Zealand Productivity Commission, Murray Sherwin. The New Zealand Productivity Commission has been looking into the country’s own productivity issues for around 10 years and Murray shared from this rich experience. Keynote Speaker: Murray Sherwin, Chair, New Zealand Productivity Commission. Murray is an economist with over 40 years of experience in a wide variety of public policy roles. He has been Chair of the New Zealand Productivity Commission since it commenced operations in April 2011. The Commission – an independent Crown entity – conducts in-depth inquiry reports on topics selected by the Government, carries out productivity- related research, and promotes understanding of productivity issues. Murray’s previous appointments include: Chief Executive and Director General of the Ministry of Agriculture and Forestry; Deputy Governor of the Reserve Bank of New Zealand; member of the Board of Executive Directors of the World Bank; and member of the Prime Minister’s Advisory Group. • Whether a lack of skills is responsible for poor productivity performance in UK firms. • The extent to which small businesses or particular sectors are the reason for poor productivity in the UK. • The extent to which under investment by UK companies explains poor productivity growth. • Weak leadership and poor management meaning businesses do not have clear strategies for business growth. • The importance of supply chains in promoting productivity of particular sectors and places. • The extent to which innovation and knowledge based capital will be the future driver of productivity in firms. We caught up with Sonali Parekh after her panel discussion to ask what she felt were the key issues around productivity. Watch below to hear what she had to say. Our final keynote speech of the day was from Professor Jennifer Rubin, Executive Chair of the ESRC. Professor Rubin spoke on “Widening the Lens on UK Productivity”, including the valuable place that social sciences has in the debate and the wide range of initiatives supported by ESRC in this space including the Centre for Economic Performance, What Works Centre for Local Economic Growth, What Works Wellbeing evidence programme and the Skills Employment Survey. Professor Rubin also spoke about vital the role of social sciences research in supporting the foundations of the UK’s Industrial Strategy and it’s associated ‘Grand Challenges’. • What we should be focusing on in terms of stimulating both future productivity growth and societal wellbeing. • Implications of automation and AI on the future of work. • Corporate philanthropy: 19th century growth was influenced by philanthropy of industrialists through educational institutions etc., how could we rejuvenate that spirit? • What governments aren’t doing or need to do differently to unlock the productivity puzzle. • Financial services regulation: what are the rules of the game in which our economy works? How do we move forward? • Thoughts on the regulatory context behind the swing towards property and asset holding for wealth creation, rather than more productive routes (a debate led by Sir Paul Collier) – can we and should we changes this situation? 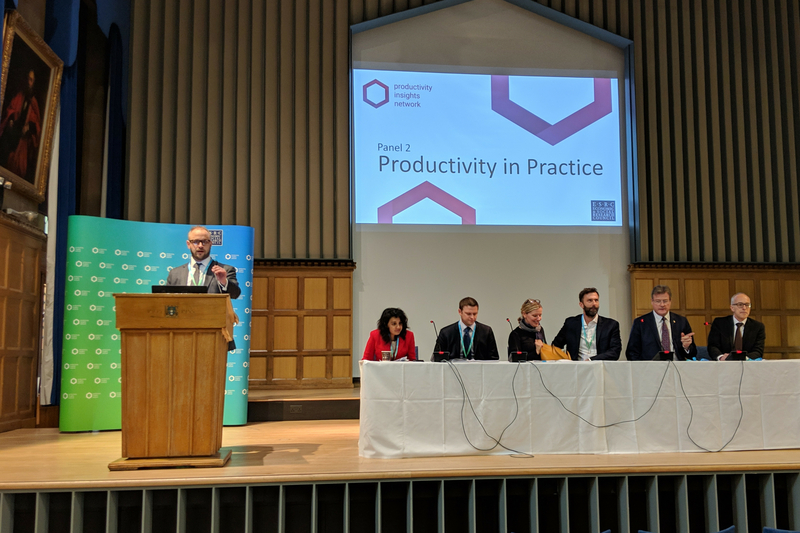 To close the conference, Professor Philip McCann, PIN Co-director, shared our gratitude to all those who joined us and continue to work alongside us to help advance the debate on UK productivity.